Leaving meat on the grill for too long or using too low a temperature to cook thinner cuts can result in it becoming overcooked. 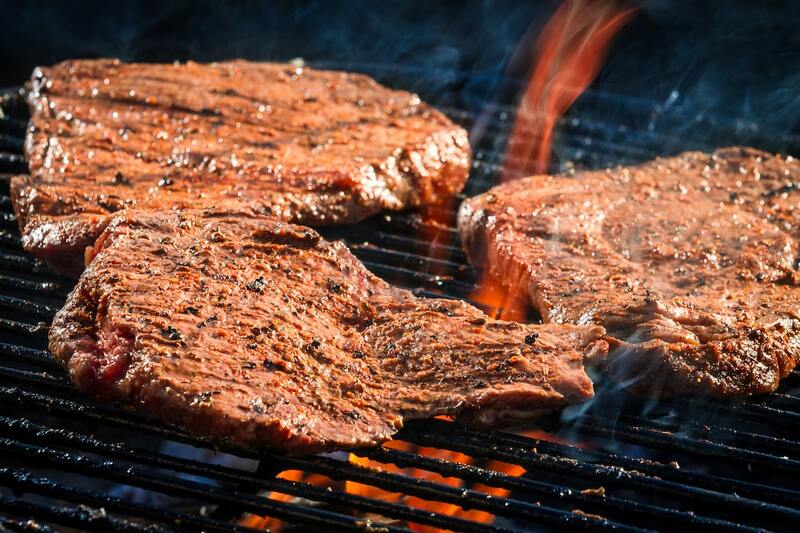 For most steak lovers, there is nothing worse as it amounts to ruining all of the qualities that make steak special. Among the problems you will face with an overcooked steak will be dryness and a tough texture in what should be a tender and juicy piece of meat. The best way to utilize your steak will be to use it in an application where the degree of doneness is not quite as important as it is with a grilled steak. Consider the following solutions. Philly cheese steak typically requires thinly sliced meat that is cooked quickly on a flat-top griddle before being topped with cheese or Cheez-wiz. The preferred meat for the traditional cheese steaks sold by Geno’s Steaks and Tony Luke’s in Philadelphia is usually ribeye or top round, but any kind of steak can stand in for them. The cheese, onions, and other toppings will make up for the dryness of the meat and may even help to disguise a leathery texture. Stews usually start out with browned meat to which wine and perhaps broth are added for moisture. A stew will then be braised for a long time to tenderize the meat and break down any connective tissue. The braising and the moisture will work on your overcooked steak just as well as it does on meats that traditionally reserved for stews. Making a stew with your steak will soften the meat and give it flavor. Any flavor from the grill should complement the herbs and spices in your stew, enhancing the savory notes. To use steak for stew, simply cube it and cook it as you would chuck or any other stew meat. Most stir-fried dishes include a sauce along with vegetables and/or noodles, all of which will add moisture. You will want to use thinly sliced steak for your stir-fry. Thin slices are important since stir-fried dishes are not usually cooked for for as long as stews. This will ensure that there is as much surface area exposed to the sauce as possible, which will give your steak flavor and help to break it down. Cutting thin slices also helps to shorten the muscle fibers so that the meat will not be as chewy. Hash has long been a favored dish for using up leftover beef and your overcooked steak should work perfectly in it. Chop your steak finely and fry it with some cubed baked potatoes along with a few herbs and some diced onion for a hearty breakfast or supper dish. You will want to add the steak last since there is not a lot of additional moisture in this dish, so you don’t want to risk overcooking the steak even more. Perhaps the simplest option is simply to slice your steak as you would for a stir-fry and to toss it in with your usual salad ingredients. Add an acidic or spicy dressing to compensate for the meat’s dryness and lack of flavor and you should be able to salvage your steak without too much trouble.